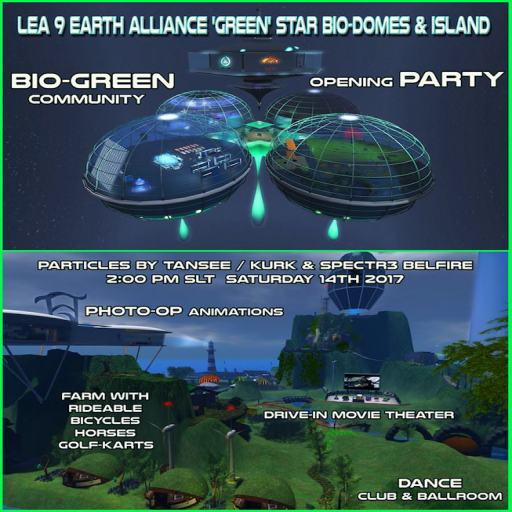 The need for 'green' energy and our space program at NASA inspired this participatory art sim being built. Going on the concept of reuse/reduce/recycle; we reused items in our inventories and added new items to make areas that are all green. Please take note of all the builders whose items we enjoy on the sim. More, now than ever our planet needs us to live green and prepare for the future. We have many types of green living scenes and photo-op areas on the sim with many animations. Special thanks go to LEA committee for their accepting the project and to Tansee and Mellydee MacFanatic for their amazing contributions, and to Kurk and Spectr3 Belfire for helping with particles for the opening event. We have ridable horses, electric golf-carts, bicycles, and space-jets. There are 4 media areas to enjoy. For media you need quicktime on your computer. We are all connected to all of the Universe and we need to Protect our Planet for our grandchildren's grandchildren.